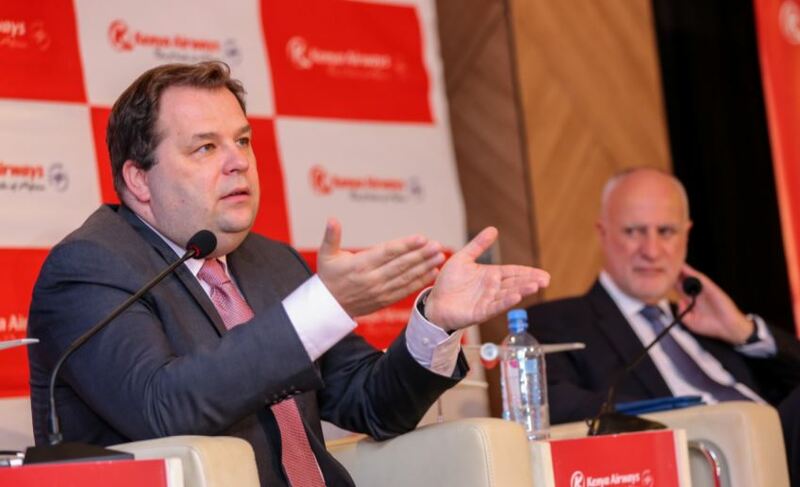 Kenya Airways chief executive Sebastian Mikosz answers questions from members of the public. I perfectly understand the shareholder expectations on payment of dividends from KQ. The current situation is, however, that unlike in the past, KQ’s position has been affected by a drastic change in market conditions which in turn affected the organisation’s profitability. My focus is on improving our equity and balance sheet by employing a different operating model, so we get back to profitability. These include development of ancillary revenue streams, improving the efficiency of our aircraft deployment, opening new routes and developing a maintenance, repair and overhaul (MRO) strategy. We will need to leverage our profits to support the growth of the airline back to a respectable financial position to enable us pay dividends. Significant reinvestment is, therefore, required to return the airline to its rightful position as a major player in the Africa aviation market. Our overall aim is to return to a sustainably positive financial position where we can meet shareholder expectations. Let me take this opportunity to once again give the correct position regarding my contract. It is for a three-year period. It runs from June 1, 2017 and ends in June 2020. Firstly, the allegations of corrupt practices in the company in the past are yet to be proven to the relevant authorities, and I welcome anyone with proof to present them. This is the only way we can make true change. From the time I joined KQ, market conditions have changed. The airline environment has become more competitive and we therefore need to adapt to remain relevant. From a human resource perspective, we need to shift the mindset that we are a State corporation and adopt a private sector approach to recover market share. This is a key focus area and is what we have started implementing to bring back the airline to profitability. We are opening new destinations like New York and will soon open Geneva and re-establish Rome where we will use our Dreamliners. What happened in LOT Polish Airlines was similar to the KQ situation, where despite a financial bailout we quickly undertook a restructuring that enabled it to grow back to profitability. I intend to deploy a similar strategy in ensuring the efficient growth of KQ. Let me first dispel the rumour that the PPP is controversial. This project has already been publicly condemned by commentators without taking time to understand the issues currently affecting Kenya’s aviation sector. Let us put KQ aside for a moment. Kenya’s aviation market is slowly losing share and if something is not done to arrest it, it will lose its position as a regional hub, affecting jobs and ultimately Kenya’s economy. The motivation of this PPP proposal is informed by these market conditions to ensure that we reverse the trend. The proposal is to have an SPV (special purpose vehicle) structure whose sole aim is to ensure that both KAA’s assets at JKIA and Kenya Airways—KAA’s main customer—can compete effectively with other airports and carriers in the region. This is how our competitors are currently operating. We want to grow us as we grow the aviation industry in Kenya. We have no plans at all to declare any staff redundant. In fact, we are in the process of finalising the recruitment of 48 more pilots, 100 more flight attendants and have advertised for an additional 87 Assistant Flight Pursers. This is informed by the continued expansion of our network and our ambitious business aspirations. The issue of expatriates has been blown out of proportion. KQ is a Kenyan company that operates in a global market. As such it competes with international players and needs different points of view and perspectives on the business. It needs to source talent globally as well as locally. This is normal in Airline operations. As of today, Kenya Airways employs 18 expatriates, including all secondments, out of the total number of more than 3,000 employees. This is approximately 0.6 per cent of the entire KQ staff. For your information, we have 36 Kenyans working as expatriates in other countries in the world. Should we therefore bring them back to Kenya? If we want to be global, then let us think global. It is easy to bash the airline when all is not well without taking effort to understand the real reasons things did not work out. I would rather draw lessons from it to guide our forward strategy. At the moment our focus is on returning us to profitability through reviewing our operating model to better compete in the market, efficiently deploying our assets, building our MRO capacity, and enhancing our customer experience alongside other revenue generating initiatives. SPVs have been wrongly judged in the public domain, yet there is no proof that they are involved in any financial impropriety. SPVs are basically subsidiaries that protect the financier from bankruptcy and are common in financing of large assets like ships and aircraft. From a financier’s perspective, loans are made to SPVs, where the aircraft are owned by the SPV for the duration of financing. The SPVs are incorporated in the Cayman Islands as it is a tax-efficient jurisdiction which benefits all parties in the transaction. To give you an example, JamboJet is actually an SPV formed to run operations of a competitively priced regional carrier. I was also totally surprised by the union’s actions. As KQ, we have submitted a proposal to KAA which is under consideration. KAA then needs to come back to us with their submission. In short, we are not at the stage where management is expected to engage the unions in discussions. The impression created that the proposal was finalised is therefore false and is meant to fuel negative political sentiment on a straightforward process. We are, however, committed to engaging with the union on this issue. I fully share your point of view on the market. Our model which has been successful in the past needs to be reviewed, vis-a-vis that of our competitors. We have to adapt to compete effectively, hence the proposal to mirror the competition’s business model, by consolidating airport and airline assets that will enable us jointly benefit from revenue growth. Our aim is to bring JKIA and Kenya Airways to the Top Five ranking in terms of cargo and passenger traffic and financial performance. We conduct market research to ascertain the viability of any route we are considering and New York was no exception. Kenya Airways started marketing the New York route at least one year prior to the maiden flight, and we took an aggressive market entry approach, selling the seven-day a week proposition. As we progressed we realised that seasonality is a big factor in US market behaviour. Like any business, we factored this through tactical changes to our schedule and adopted a seasonal cycle that would have five flights a week during the low season and seven flights a week during the high season. Daily flights will resume from June 20 to September 8, 2019, and from December 15, 2019 to January 15, 2020. This business cycle enables us to better optimise our investment in the route. We remain strongly committed to the New York route. I do empathise with the situation. Retrenchment is never an easy exercise for any company to undertake as it touches on the livelihoods of the staff affected. As Kenya Airways, we are constantly looking out for the best talent with the skills and experience needed to enable us to meet our strategic agenda and to meet our business objectives. I encourage you to look out for opportunities that we may advertise. Our immediate focus will be to review our growth strategy and to make the necessary adjustments. If the proposal does not go through, we do have other options. However, we all need to realise that it will take longer to realise our growth ambitions. Consequently, Kenya’s position as a regional hub will also be affected. The correct position is that this has been happening over the last two years. Staff leaving one organisation for another is a normal occurrence, even in the aviation industry. The reasons vary, from remuneration, to career growth and even to the environment. I am afraid I cannot answer for those who have left but I believe that KQ is still an attractive employer as we are still actively recruiting pilots, engineers and cabin crew. Contrary to the way this issue has been sensationalised in the public, Kenya Airways leases its aircraft from reputable aircraft leasing companies. KQ has a fleet of nine Dreamliners which are currently in operation. Out of the nine, six are on finance lease which means KQ is servicing loans towards final ownership of the aircraft (equivalent to house mortgage, where you have right of use and eventually right of ownership is transferred upon completion of the loan). The other three are on operating leases. This is a contract that allows for the use of assets but does not convey rights to ownership. The current lessors of the three leased aircraft are Peregrem, BOCA and Dubai Aerospace. All these are reputable aircraft leasing companies. I am optimistic. After two years at the helm, we have progressively improved our financial position. We have seen significant year-on-year revenue growth both in passenger and cargo business. We also continue to pay attention to costs. Management is committed to grow revenues and to address cost challenges. This will be a long and challenging process, but we are optimistic that we are on the right track.